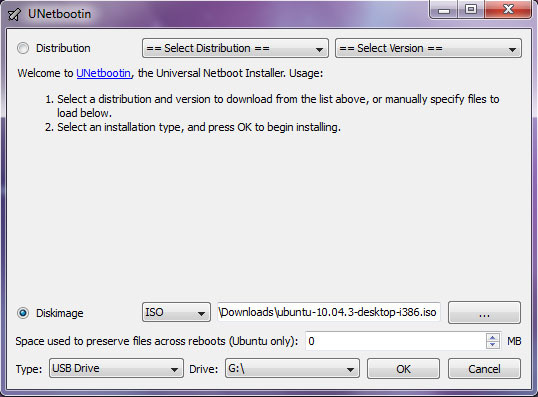 UNetbootin helps you to create bootable Live USB drives for a large variety of Linux distributions on Windows, Linux, and Mac OS X. It supports for automatically downloads the Linux distros like Ubuntu, Debian, Linux Mint, openSUSE, Arch Linux, Damn Small Linux, SliTaz, Puppy Linux, gNewSense, FreeBSD, NetBSD, Fedora, PCLinuxOS, Sabayon Linux, Gentoo, MEPIS, Zenwalk, Slax, Dreamlinux, Elive, CentOS, Mandriva, LinuxConsole, Frgalware Linux, and xPUD. Or use your own downloaded Linux .iso image file like I did on Android-x86 ISO image previously. To create a bootable Live USB drive, select a distribution to download or download an ISO image by yourself and select Diskimage, choose the target USB drive and press OK.
You can create bootable Live USB drive for Windows here.